1992 Ferrari 512 TR Coupe For Sale in West Babylon, New York 11704 If you are searching for a rare, exotic sports car that packs a punch in regards to its power and performance than look no further because this 1992 Ferrari 512 TR is perfect for you! This two-seater fixed-head coupe features a sleek design that is brimming with the crisp, muscular angles that have become an icon of the Ferrari nameplate. It comes dressed to impress with beautiful black exterior paint complemented by an exceptionally clean tan leather interior. With its artful design engineering, provided by Pininfarina, this sophisticated ride is sure to turn heads! Powered by a 4.9 liter Flat-12 engine that is mated with 5-speed manual transmission, this handsome devil is eager to provide a dynamic display of quick agile movements around every corner it meets. And with only 9,915 miles you can rest assured that this beautiful beast will inspire your love of rare exotics for many years to come! The Ferrari 512 TR was only produced from 1991 to 1994 as a further developed version of the famous Testarossa. It featured a reformulated and improved engine, gearbox, and basket. This 1992 model is one of only 2,261 units that left the factory until 1994. Not only was it mechanically advanced from its predecessor but it also came with a variety of interior upgrades as well. Highlights of these advantages include round A/C vents below the stereo, new dials and lights indicators as part of the instrument cluster, and a modern steering wheel design. It also came with a new console below the dashboard which integrated the steering column and featured a mid-mounted three-gauge cluster. Other components of the 512 TR's interior face lift included new door panels, new handbrake lever, updated audio system, and reshaped A-pillars. 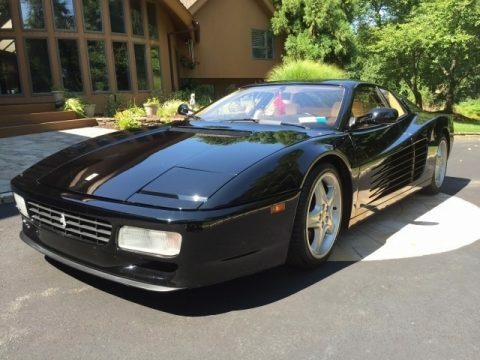 This 1992 Ferrari 512 TR Coupe has been meticulously maintained, which has enabled its excellent condition. Perfect for anyone who appreciates fast, fun, and fierce vehicles. Very few 512 TRs are still on the road. Fewer still is the number of road worthy drivers in such impeccable condition as this one. Don't miss out on this amazing opportunity to own the exotic sports car you've been searching for at a very handsome price. Call today for more information on how you can get behind the wheel of this unparalleled 512 TR.